Sooooo super cute! And how nice of you to give your Cricut Christmas Eve off :o) Merry Christmas, and happy new year to you and your family!! Merry Christmas to you and your family Emma! Thank you for all you do to bring us such great projects! Always love your videos! Merry Christmas Emma & family! You Rock!!! Where did you get that awesome puffy paint? You started to say but I guess I missed it? A very cute card.... Every week I found some new crafty idea to use because of your talents; Thank You! Merry Christmas to you and your family Emma! Wishing you and your family a very Merry Christmas and a New Year filled with nothing but the best! Thank you so much for a year of inspiration & fun! So cute Emma!! Merry Christmas!!! Merry Christmas Emma! That card is so cute. Merry Christmas Emma!! Adorable card!! Love the little puffy paint on the Santa!! Cute card! :) Happy Holidays!!! I just stopped by to wish you and your family a very Merry and Blessed Christmas!!! Your card is adorable. Thanks for all the work you have done for us(your viwers). I wish a very Merry Christmas too. Wishing you a Merry Christmas! I am glad you got your big polka dot embossing folder- Love "Our" Card. cute card, I love it santa is adorable. Super cute card!!! Merry Christmas to you and your family!! Glad to hear your dad is doing better. What an absolutely adorable card!! Merry Christmas to you! I'm glad to hear that your Dad is doing well! Lovely card! And I wish you and your family a very Merry Christmas! Merry Christmas to you and your entire family. Happy to hear your dad is doing fine. The card you made is so adorable. thanks for sharing. This card is adorable. Hope you have a very Merry Christmas! thanks for all the coupons and ideas thru the year, Hope you have a Merry Xmas and Happy New year. Thanks so much for sharing your Santa card with us. Santa's smile is too cute. May you have a blessed New Year!!! Very cute.... It's always nice to see that we can still create other things without using our cricuts. But I must say I love that bug! Adorable!!! 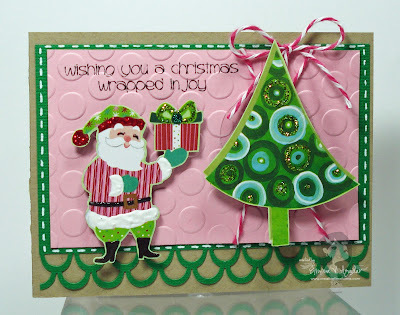 I love that santa...and the oh sooo cute tree, and the pink perfect! TFS! This card as all your other creations is just amazing.